18 November 2007: The son of two congressional figures and the grandson of a former military dictator, Samuel Moreno could be seen as a predictable victor in the 2007 race to govern the Colombian capital. However, after a bitter fight, Moreno can also be viewed as part of the wider tendency among Latin American big cities to provide left-leaning city chiefs in the post-Washington consensus era in the region. Update: September 2011: Samuel Moreno jailed pending trial on corruption charges. 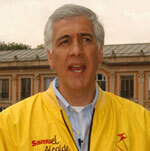 Update May 2011: Colombia's Inspector General suspended Mayor Morno pending an enquiry into corruption. The acting mayor is Clara López Obregón. Samuel Gustavo Moreno Rojas studied at three universities in the Colombian capital and Havard in his (almost) native US, but it was his early period that was most likely to mark out his political future. Born outside of the country in Miami in 1960, Moreno’s early life was characterised by the political struggle within Colombia, with his parents and grandfather engaged in the turbulent political strife which affected both electoral and extra-parliamentary politics in the country. While Moreno is a leading member of the Alternative Democratic Pole (PDA), the principal opposition bloc to right-leaning President Alvaro Uribe, the party’s own path to formation provides an illusory tale of both Colombian politics and his own family’s central role within in it. The Independent Democratic Pole (PDI) was formed as a left bloc in the Colombian congress, bringing together an array of disparate sections and interests, from indigenous groups to former Marxists. One of the currents within the PDI is the National Popular Alliance (ANAPO), founded by Moreno’s grandfather, the former military dictator (1953-57) Gustavo Rojas Pinilla, which later became a vehicle of protest against the fraudulent election of 1970 and the preservation of the National Front duopoly of the Liberal and Conservative parties. Samuel’s mother, María Eugenia Rojas de Moreno, then contested the 1974 presidential election, the first female presidential candidate in Latin America, on behalf of her father’s party. Moreno himself served as ANAPO’s youth coordinator (1982-85), Bogota coordinator (1985-87) and national coordinator (1987-2003). Unlike Alvaro Uribe the PDI believes in a negotiated settlement with the FARC guerrillas (it should be mentioned his father was assassinated by them), who have waged a violent insurgency against the Colombian state from the countryside since the 1960s, though it does not endorse their struggle, in spite of being led by the former leader of the now disbanded M-19 guerrilla group. As well as the left-wing insurgency, the country is further destabilised by the presence of right-wing paramilitary groups, many linked to drug cartels and accused of murdering trade unionists, often in collusion with the state. The staunchly pro-US policies of the Uribe administration, both domestically and internationally, are often seen as a contributory factor for the international community’s lack of scrutiny of the human rights situation in the country. Colombia is the only large country in the region not currently governed by a left-of-centre president. In advance of the 2006 presidential elections won once more by Alvaro Uribe, it announced the formation of a new electoral alliance with the Democratic Alternative (DA), which was itself formed of sections which refused to join the PDI. The new alliance, the PDA, has nine out of 166 deputies and 11 of 100 senators in congress. Like his mother and brother Ivan, Moreno is a former senator (1991-2006) and also attempted to secure the PDI presidential ticket in 2006 (alongside his predecessor as mayor, Luis Eduardo Garzón), before deciding to leave the senate to run for mayor of Bogota against the Uribe-sponsored candidate, former mayor Enrique Penalosa. The campaign was particularly bitter, even by Colombian standards, with Uribe and his supporters smearing Moreno as being linked to FARC rebels. Having defeated Penalosa 43.7% to 28.2%, possibly after Uribe’s remarks backfired, Moreno will take office in January 2008. 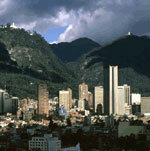 Bogota serves as the capital district of Colombia, housing all three branches of government. It is governed by the city-wide District Council of Bogota, comprising the elected mayor and city council, and 20 smaller local administrations, each with their own elected council and a mayor appointed by the principal mayor following nomination by their council. The capital district was originally created in 1955 by Moreno’s grandfather General Gustavo Rojas Pinilla by merging the city centre and surrounding municipalities, before being legally recognised by the new popular democratic constitution of 1991. Bogota also serves as the capital of the Department of Cundinmarca, while serving as a department itself, a constitutional technicality. There is also a Metropolitan Area of Bogota which exceeds the boundaries of the capital district (with a further 17 municipalities) but serves as a legally defined planning and statistical region for state and national government purposes. The mayor of the Argentinean federal capital Buenos Aires represents both a sea change in the nation’s recent turbulent political history and a populist touch to the problems which have blighted the city in spite of continuous economic growth and stability. The conservative businessman first ran for mayor in 2003 following his stint as president of one of the country’s best-known football teams, eventually securing election to Congress in 2005 and as mayor in July 2007.